If you are enjoying the charms of our lovely Turunc, but you would like to see much more of what Turkey has to offer, then we have just the proper tour for you. 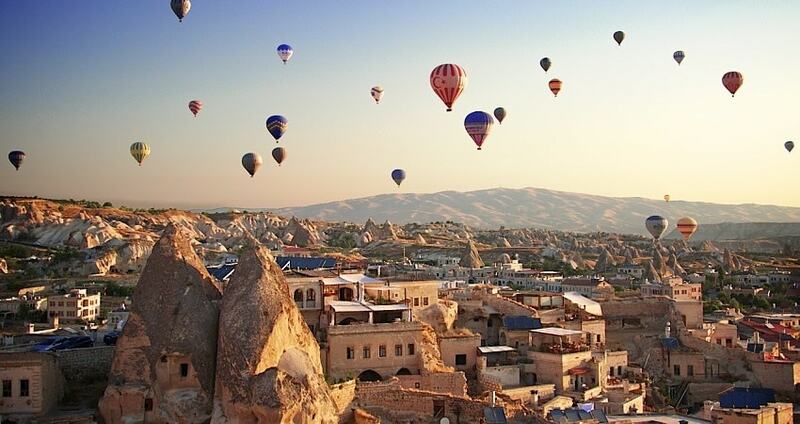 Our Turunc Cappadocia Tour is exactly what you need for a memorable vacation. Turunc Cappadocia Tour starts with a pick up from your respective hotel in Turunc. Trip from Turunc to Cappadocia is about 770 kilometers long. However, you shouldn’t worry since you will be traveling in the fully equipped busses of Rahmi Hamurcu company. All of the busses are Mercedes Trevego equipped with cooling systems and comfortable seats. During the ride you will be able to enjoy a coffee, tea, some soft drink, water or some delicious snacks. The drive lasts approximately 13 hours, and we are supposed to get settled into a hotel in Goreme at 7am. Our arrival will be followed by a tasty open buffet breakfast. Afterwards, you will get some time to rest and freshen up. Our adventure of Turunc Cappadocia Tour will start at 9.30am when our driver will take you for a ride to Uchisar Castle. Uchisar is set on the highest point of this area. The castle includes several rooms carved into rocks, linked with passages and tunnels. Next on our list of destinations is the Goreme Open air Museum. This Museum is on the UNESCO World Heritage Site list since 1984. It consists of astounding churches cut into rocks, with gorgeous frescoes covering their inner walls. You will get to visit St. Barbara Church, Snake or Yilanli Church and others. This museum is one of a kind and truly a breath-taking site. Our next visit will be the one to a very old and captivating village called Cavusin Old Greek Village. This lovely village hosts the amazing church of Saint John the Baptist. This wonderful old cave church is unusually large and it consists of three rooms. In Turunc Cappadocia Tour, we will also have a stoppage at Pasabag also known as the Monkey’s Valley. 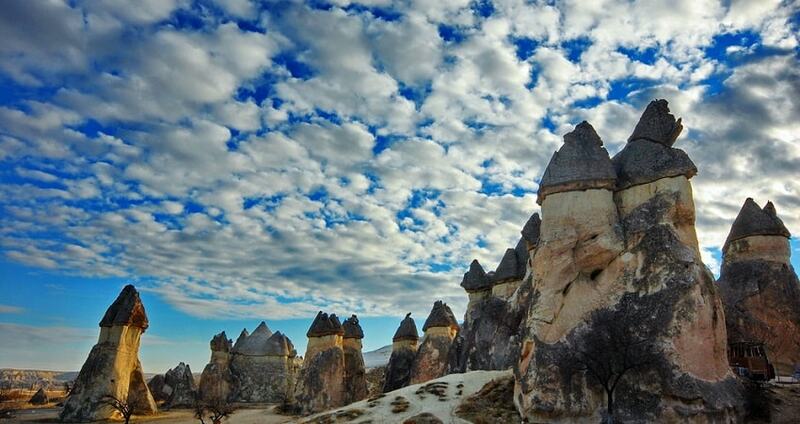 This valley is well known for its fairy chimneys, come of which feature two or three rock caps. You will also get to visit the lovely chapel of St. Simeon, and a real hermit’s shelter, which is carved into the chimney with triple hat. After our visit to Pasabag we will have lunch and go on with our journey. Next, we will visit the charming Avanos. This town is known for its red clay products, which are crafted of the red clay found on the shores of Kizlirmak, or red river. From here we will move to Devrent Valley known for its lunar landscape. This valley looks almost otherworldly as it is fringed with strange-looking rock formations. We will also visit Urgup where we will get to see its terrific fairy chimneys. Lastly, we will stop by the carpet factory in Goreme, where you will get to check put the process of the making of famous oriental carpets and colorful kilims. 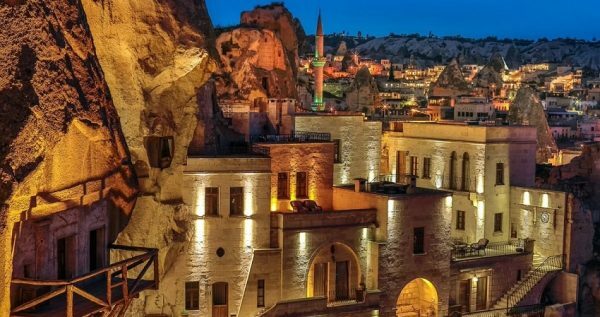 Our escapade through North Cappadocia ends at 5am, when you will get to take a rest and unwind at the Cappadocia Inn Hotel. For those most adventurous among you we also provide a hot air balloon tour. This tour begins with an early-morning pick up and a drive to the venue, where you will have a light breakfast. You will also get a useful briefing about some safety regulations. In Turunc Cappadocia Tour, you will get to see Cappadocia’s famous rural landscapes from a completely different and amazing perspective. We will end the trip with a champagne-celebration. You will also get your own Hot Air Balloon Flight certificate. The tour lasts for a minimum one hour, but there are also longer flight options offered. Our second day starts with a breakfast, after which we will go for a tour through South Cappadocia. Our first stoppage is at Derinkuyu, from where we will continue on foot. 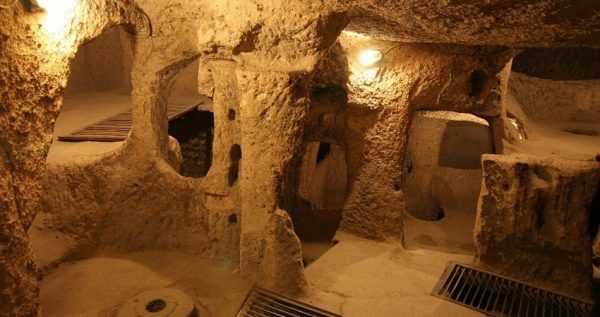 You will get to see the amazing underground city of the ancient civilizations of Hittites. 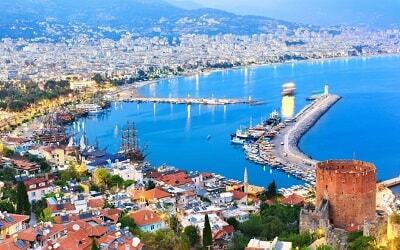 This stunning city is 85 meters deep and it includes cellars, churches, wineries, stables and other rooms. Afterwards, we will go for a lengthy walk by the Melendiz River. We will be walking through magnificent Ihlara Valley. This terrific canyon was once a busy place with over four thousand homes and a hundred cave churches, of which we will visit several such as Agacalti Kilise or Church under the Tree, and Purenli Seki Kilisesi or Church with the Terrace. After the walk we will have a delicious lunch. Next, we will go to a Selime Monastery. This astoundingly gorgeous monastery is cut into a rock and it is located in Selime Village. This monastery is the biggest religious building in this area and it was once used for both military and educational functions. 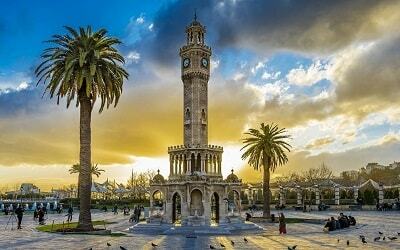 Nearby is also the Selime Sultan Turbesi or The Monumental Tomb, which is surrounded by an ancient cemetery. Afterwards we will go to the fantastic Pigeon Valley, that got its name because it features hundreds of pigeon houses cut into the rocks. We will also visit an onyx factory because onyx production is one of the symbols of Cappadocia. 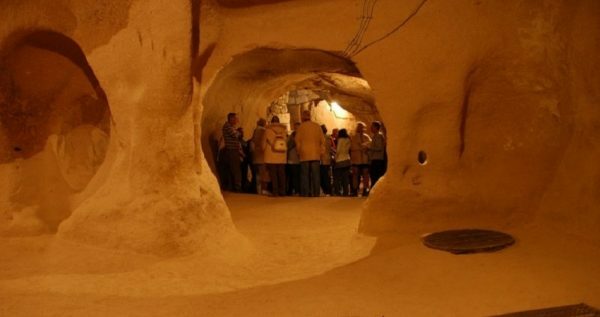 Turunc Cappadocia Tour ends at about 6pm, when the driver will take you to the bus station. You will have some spare time till 8pm. Afterwards our driver will come and take you back to Cappadocia Inn. You will get to have a full night of sleep, and in the morning, we will head back to Turunc. 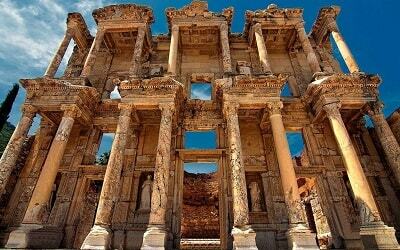 If you like overnight excursions then Ephesus Pamukkale Tour can be also interesting for you. Turunc Cappadocia Tour starts at 4.15 pm, when you will board one of the comfy busses and head to Cappadocia. All of our busses belong to the Rahmi Hamurcu company, and all of them have air-conditioning systems and comfortable seats. We are expected to arrive to the hotel at Goreme at approximately 7am. Once you’ve had your breakfast at the Cappadocia Inn Hotel and freshened up, our driver will pick you up at 9.30am. 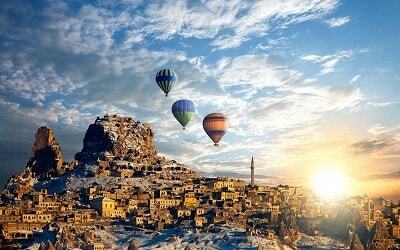 We will go to visit the phenomenal Uchisar Castle, at the highest peak in Cappadocia. The castle is cut into the rocks and it consists of rooms, stairs, passages and tunnels. 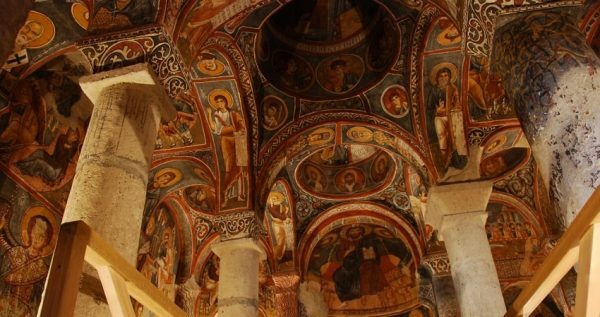 We will later visit the splendid Goreme Open Air Museum which includes numerous stunning churches carved into rocks with marvelous frescoes inside. This lovely museum is a proud member of the UNESCO World Heritage List. Afterwards, we will go to Cavusin Old Greek Village, where we will get to see the captivating church of St. John the Baptist, and also witness the most gorgeous panoramic view of the whole surrounding area. We will then move on to Pasabag, or Monkey’s Valley. This terrific valley is interesting because it features some wonderful fairy chimneys with two or three roc caps on top. Side from the marvelous chimney, while here, we will also visit the chapel built in honor of St. Simeon, and an old hermit’s dwelling. After our visit to Pasabag we will have a delicious lunch, and move to Avanos. Locals at Avanos produce marvelous items made by using the red clay from the nearby Red River. Here you will get to witness how some delightful pottery objects are created. Afterwards, we will go to Devrent Valley, near Goreme. This valley is well-known for its breathtaking lunar landscape, featuring bizarre-looking rock formations. 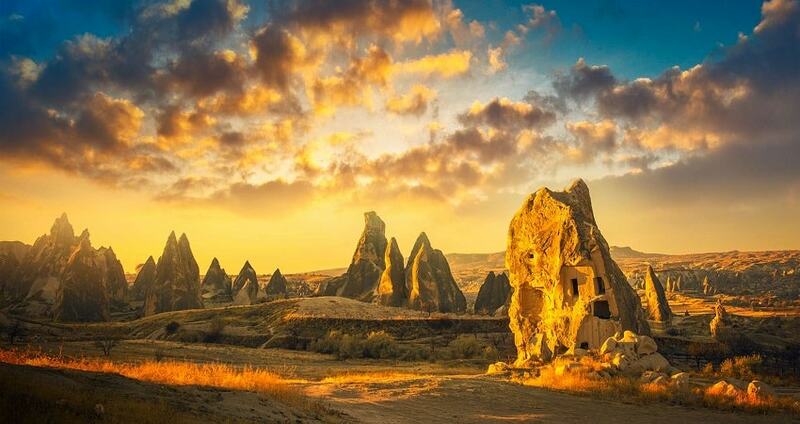 We will also visit Urgup for its exquisite fairy chimneys, as well as a carpet factory in lovely Goreme. At the factory you will get to observe how the famous Turkish kilims and rugs are made. After our tour at about 5pm, our driver will take you back to Cappadocia Inn. You will have free time for the rest of the day, so you can relax and enjoy your surroundings. If you opt to take a wonderful Hot Air Balloon Tour over Cappadocia with us, you will have to wake up early, as our tour starts in the early morning. 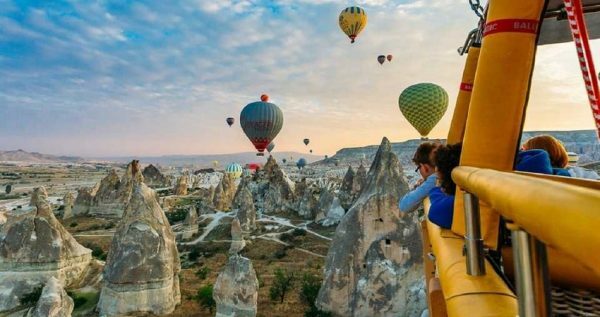 This tour is a true adventure, as you will get to observe the delightful landscape of Cappadocia from a completely different perspective. Once we reach the venue, we will be welcomed by our expert instructors, who will explain some basic thing about Balloon Flying, as well as some security regulations. Afterwards, you will have a light breakfast and go for your Balloon ride. The Standard Balloon ride lasts one hour, but you can also opt for a Deluxe Tour which lasts hour and a half or more. After the flight, we will throw a bit of a celebratory party involving champagne, and you will get your special Hot Air Balloon Flying certificate. After the flight, our chauffeur will drive you back to Cappadocia Inn Hotel just in time for breakfast. Second day of our stay in Cappadocia starts with a delicious Turkish breakfast at the Cappadocia Inn Hotel. After breakfast, at approximately 9.30am we will continue with our splendid tour with a drive from the hotel to the Southern part of Cappadocia. When we get to Derinkuyu, we will resume on foot. Our first destination is the magnificent Hittites underground city. This city features 600 outside doors and it is 85 meters deep. You will get to go through some of its passages and rooms, and get a feeling of how the ancient Hittites lived. We will continue with our tour with a long walk along the Melendiz River, through Ihlara Valley. 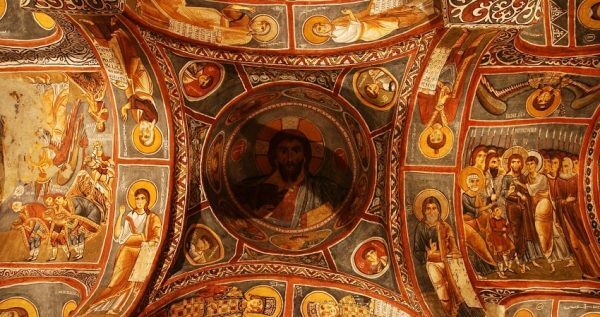 There we will get to visit numerous old cave churches which contain some glorious frescoes, and much more. We will also have a delectable lunch while we are in the valley. Next, we will the monumental Selime Monastery, which is the largest religious temple in Cappadocia. 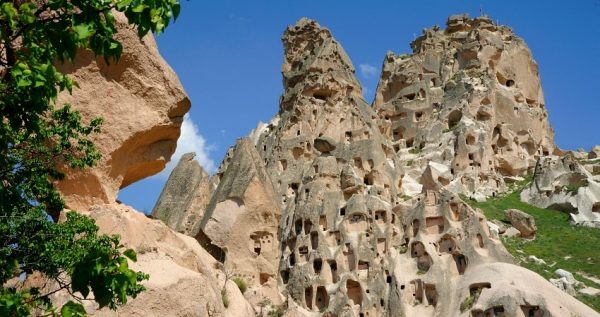 We will also visit the charming Pigeon Valley, famous for the hundreds of pigeon dwellings cut into the mountain rocks. Lastly, we will have a stopover at the onyx factory, where you will get to know more about these precious gems and their production. Afterwards, our chauffeur will take you to the bus station, and you will have some downtime till 8am, when our bus will come and take you back to Turunc. The price of this awesome two-day tour includes full insurance packages, all entrance fees, guides, two breakfasts, two lunches, bus tickets, and a hotel overnight stay.